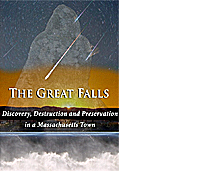 Professor Brian Adams of Greenfield Community College reviews the history of human habitation in the Connecticut River Valley. Click the image to play. Professor Robert Goodby of Franklin Pierce University narrates a slideshow of the archaeological excavation at the new Keene Middle School, the Tenant Swamp Site. Click the image to play. 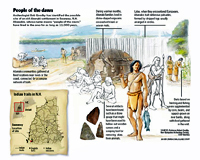 Early man in Swanzey is depicted in this informative drawing. Click the image to enlarge. Audio: "Early Bow and Arrow Use"
This Boston Museum of Science podcast describes the early history of archery. Click the image on the left to get started. The Hidden Landscapes project is developing new models of the life of ancient peoples of the Northeast. Click the image to read more and to see the trailer. The Wampanoag of Southeastern Massachusetts tell a remarkable story of cultural revival: they are bringing their language home again. Click the image to see the trailer. 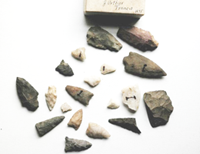 Join Professor Robert Goodby as he tours archaeological sites in Swanzey along the Ashuelot River. Listen to the mp3 podcast. WFCR's Field Notes interviews Professor Elizabeth Chilton about the role of corn in the lives of native Americans in the Pioneer Valley. Listen to the podcast.